The long distance motorcoach market in North America has been going through a renaissance over the last few years. While Amtrak has the highest annual ridership in its history, a series of long distance coach operators are redeveloping their services, launching niche products, lowering prices and increasing their relevance as a core part of the intercity transport market. 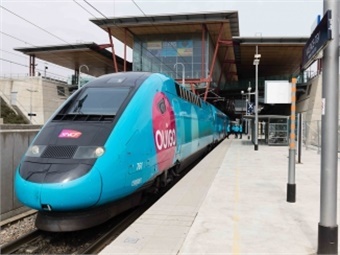 Many of these issues are also present in Europe and long distance train operators are also facing increasing competition from new and previously restricted coach operators. There are a number of market differences and specific issues in some countries, but very powerful rail-centered mobility operators are updating their business models and services. In this article, I will concentrate on some of the responses from two key markets, France and Germany, regarding surface transport rather than air. Within Europe, a key starting point in this story is the role of the European Union (EU) in progressing the development of a competitive market in rail services across the continent as part of the creation of the “single market” in goods, services and people. Since the early 1990s, the EU has been progressing liberalization of rail services within countries and across borders to provide greater choice, as well as better quality and prices. Over the years numerous new services have commenced along key rail routes. An illustrative example would be in the European capital of Brussels, Belgium where long distance rail services are provided by the Belgian national operator — SNCB, as well as French high-speed TGV services; German ICE high-speed services; Swiss Railway operated services to Basle; Thalys services to the Netherlands and France; and Eurostar services to London. Similarly, across the continent local rail services are being tendered, often by regional authorities, and operated by new entrants as well as the former national operators. The Dutch national rail operator Nederlandse Spoorwegen (NS) has recently announced that it would cease tendering for local train services in the Netherlands and concentrate on regional and international services. As a consequence of the liberalization of the train market on an ongoing basis across the continent, many countries have also considered the impacts, rationale and benefits of long standing restrictions that had been in place on intercity coach operators — restrictions largely to protect the market for the former state rail monopolies, as well as the substantial public investment in rail infrastructure. Specifically in France, long distance rail finally lost its protection against the coach market in mid-2015. New French coach services are being provided by groups such as Transdev via its “isilines” brand, Megabus, the existing eurolines group; and rail operator SNCF. In Germany, the long-distance surface transport market was de-regulated in January 2013, and since then, the coach market has seen significant growth and slowed the steady historical growth in long distance rail patronage. 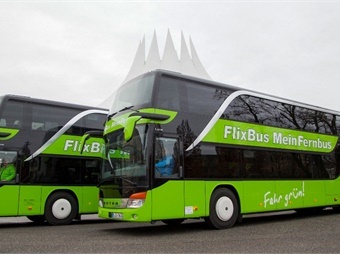 Coach services are being provided by a range of new and historic operators, including MeinFernbus, Flixbus, Postbus and Deutsche Bahn at prices generally much lower than train services. As a comparison, the UK has allowed competition between coach and rail operators since the 1980’s. Most key towns and cities are served by both long distance coaches and rail services. While rail tends to be dominant in most corridors, coaches are particularly competitive on certain routes, such as central London to Oxford where the rail network is historically somewhat slow and limited, as well as, generally, for the university and college intercity markets. Coach operators are typically operating services with a distinct price advantage over rail. Within the European context these services usually have significant time penalties versus rail and of course, more limited onboard room and facilities. Nevertheless, rail services — local as well as particularly high speed — are a core element of the development of a modern, efficient and sustainable transport system across the continent. Huge sums of state funds have been invested in these systems and a key EU policy is to progress key linkages between countries or physical barriers. Examples include the new rail tunnel under the Alps now under construction between the major centers of Lyons, France and Turin, Italy, or the new direct-rail route involving a sub-sea tunnel from Copenhagen, Denmark to northern Germany. A country such as France has invested billions of euros in its high-speed rail networks since the first services from Paris to Lyons in 1981. While competition between modes and new operators is expected to improve services for all, the existing rail operators are expected to react to new mobility players with improved service offers and in effect, justify the large public investments that have been made in the infrastructure that they are using. The French rail operator — SNCF, which is now a private business but state owned, has recognized the competitive threat of the new coach operators and has, in fact, taken the approach of developing discounted high-speed rail services, as well as its own discount coach operation. Both services are operated under the “Oui” brand. An earlier version of these concepts was the “iDTGV” brand, which is still in operation. This model moved much of the ticket reservation, confirmation and boarding process online to reduce costs. Generally, the same mainline train terminals were used as with the full high speed TGV services. More recently, SNCF launched the “Ouigo” train service in 2013. They have considered the cost base of a high-speed train operator and reduced the level of service on a range of key dimensions to offer more competitive prices. Ouigo serves destinations in the northwest, north and southeast of France from Paris. The service bases its network in Paris, but uses a suburban high-speed station — Marne la Valee-Chessy, which is well connected to the rest of the local public transport system rather than the main central Paris rail terminal stations, such as Gare du Nord. Secondary terminals are also often used in other cities. This reduces the rail network access costs for the service. However, Ouigo still uses the high-speed network tracks and so maintains the time advantage over other modes of travel. Tickets are only offered online and in advance of travel. That is, you can’t buy a ticket at a station ticket window for any of these services. Luggage is separately charged for and limited. The rolling stock seats up to 1,200 people in a high density, double level, standard class arrangement. The trains are without the typical buffet car services. SNCF seems to be content with the success of Ouigo in keeping price conscious travelers on the rail network as well as stimulating new demand for price sensitive travelers. Most importantly, it is giving the rail operator a credible response to the rise of potentially lower cost competitors. The Ouigo brand is continuing to expand within France and new routes are being considered, even potentially to London. To further increase the competitiveness of train services, the French rail operator has now expanded the Ouigo concept to also include discount coach services and directly compete with the other coach operators in their core market. Branded as Ouibus from 2015 and commencing service in 2012 under the brand IDBus, Ouibus, covers routes throughout France from bases in eastern Paris, Lyons and Lille. It also operates to neighboring countries. On board services include free Wi-Fi, power sockets and reclining seats, as well as the use of central coach terminals and ticketless service based on identity. "Thalys" is the high-speed train service operating from Paris to Brussels and Amsterdam as well as Cologne, Germany. 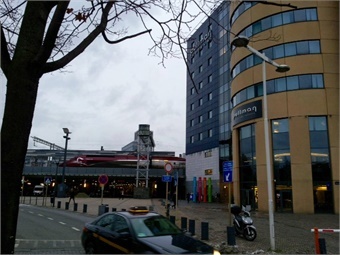 The operation is majority owned by French rail operator SNCF as well as the Belgian operator SNCB and Deutsche Bahn. The highly successful service has been operating since 1997 and can travel the 200 miles between the two key cities of Paris and Brussels in about 90 minutes. These markets have robust leisure as well as business demand. Nevertheless, these corridors in northwest Europe are highly urbanized and crossed by numerous high-quality highways. Road travel between the cities typically takes about three-and-a-half-hours in good traffic. A range of coach operators are serving this market, including Eurolines, Ouibus and Megabus. Coach ticket prices are typically very competitive at approximately 10 euro for advance purchase each way. Rail tickets are typically 50 euro for a single. 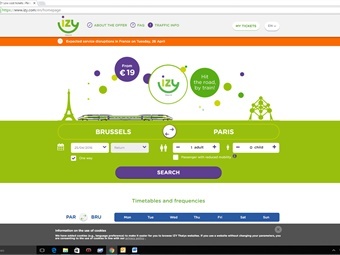 Thalys has now brought a new low-cost rail service to the corridor via its new "Izy" brand. This more cost competitive service is offered via utilizing an existing and specially branded French TGV train set on which ticketing has been moved online only, larger pieces of customer luggage are charged for, part of the route is via the slower classic rail lines, seating density has been increased and onboard catering reduced. Many of these operational models are already used by low cost airlines in Europe. The Izy model is an interesting test of customer preferences, as the rail operator is effectively reducing each of the specific benefits of high-speed rail to find the point at which customers will still find it advantageous and competitive, but at which significant cost savings on the travel price can be made. Within Germany Deutsche Bahn (DB), a now state-owned, but private company, provides the vast majority of rail services locally, nationally and internationally to neighboring countries. Local regions are in the process of tendering local services and DB is now facing increasing competition for these networks. Transdev, from France, is also running a few medium distance train services wholly within Germany. DB is taking a different approach from that seen in France to the sudden surge in use of coach services. It is focusing on its core long distance services and making them work more efficiently and competitively rather than building new sub-brands or selectively reducing the service offer. Initiatives include, faster, more frequent trains covering a wider set of the larger German cities and towns, with better onboard services – catering, Wi-Fi, free seat reservations, etc. — and service quality with a significant multi-year investment of several billion euro in each of these dimensions. These investments should also increase network punctuality. It should be noted that the German market is more dispersed than, for example, the French market, which is highly concentrated on travel to and from Paris. Also, while both countries are building new high-speed railways, the French network is more extensive and operates at higher speeds. While focusing on the efficiency and effectiveness of its core rail operations, DB has also looked to learn from the disrupters entering the German coach market by setting up its own coach operation. “IC Bus” currently offers services mostly from Berlin and Hamburg north and east to Poland and Denmark, across southern Germany to Switzerland, Italy, Croatia and Slovenia, as well as from western Germany to the Netherlands, Belgium and France. 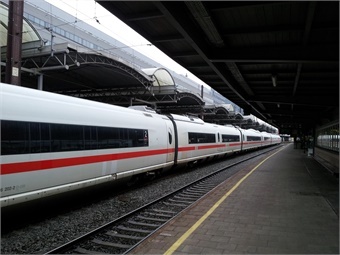 The services are comparable to other modern intercity coach services and highlight the interconnection abilities between these services and DB trains. A further element in the evolving competitive rail landscape is the rapid development of ride sharing services in Europe. Technology and rise of the sharing economy is allowing the car to be reconsidered as a “new mobility” mode. Ridesharing can enable minor increases in the occupancy rates of highway car traffic to create significant increases in transport capacity. This also has the potential to significantly increase the competitive marketplace for the major train operators. 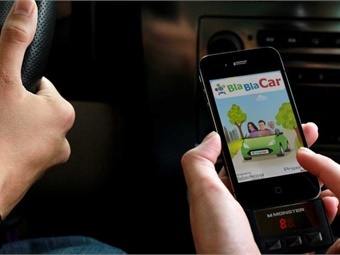 There are many of these new and fast growing ridesharing services being developed, such as www.blablacar.com from France and www.drive2day.com from Germany. The large OEM car manufacturers are also almost all considering and developing carsharing services, which mostly concentrate on urban driving, but will inevitably also consider the intercity market. The intercity rail market is still generally growing and a dominate form of mobility across the European continent. Unlike in North America, while intercity personal car travel is widespread, rail is often considered quicker, easier, cheaper and more reliable. As a result billions have been invested over the last few decades and are forecast to continue to be invested in improved rail infrastructure. However, the market is now becoming more complicated. Coach travel is aggressively trying to carve out a niche in the market across the continent and is aggressively pricing itself versus trains. The low-cost airline model is also well established. The large train operators are considering how they can respond — re services, prices or sub-brands. Meanwhile, the disruption of ridesharing and the rapid growth in new ways of using the car is perched on the horizon as potentially the most fundamental disrupter to all.